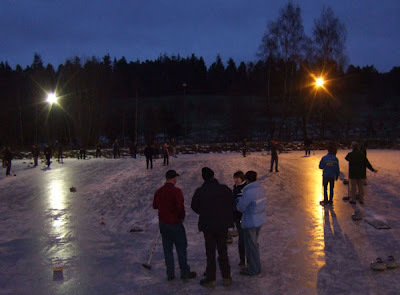 Never mind all the other curling that is going on indoors this weekend at Lockerbie, Greenacres, Perth and Berne, this is the important venue! Curlers up north played their Deeside Curling Association Bonspiel today. 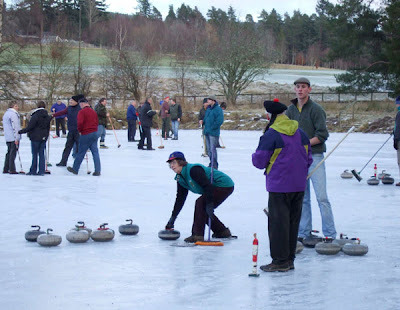 It was held on the curling pond at Tarland (which is not far from Ballater on Royal Deeside - details here) and the Scottish Curler correspondent (Royal Club Board Member Anne Malcolm) reports that conditions were fantastic - wonderful, keen ice and blue skies! The Barclay Harvey trophy was won by the Tarland Club with Balmoral the runners-up. And from the photo below, they didn't stop as it got dark! Many thanks to Anne Malcom for the photos. The Editor is very jealous! But we did have snow this morning at Lockerbie.